Three Wolverhampton men have been jailed for their roles in 10 armed raids in which over £100,000 was taken. A claw hammer or knife was used during the robberies of G4S security van drivers in Worcestershire, the West Midlands, Shropshire and Staffordshire between June 2013 and April 2014. Adrian Durant, 30, and Craig Perry, 33, were jailed for 14 years and 12 years respectively for conspiracy to rob. Lee Tonks, 34, was sentenced to 18 months for assisting an offender. Sally Hipkins, 29, of North Road, Tipton, was given a two-year prison sentence, suspended for two years, for converting criminal property. There were two armed robberies in Telford and Shifnal, both in Shropshire, and two in Stafford, with one in Penkridge and Burntwood, both in Staffordshire, Kidderminster in Worcestershire and Wolverhampton, police said. As well as the 12-year sentence for conspiracy to rob, Perry was given two years for arson and 12 months for aggravated vehicle-taking. The sentences are to be served concurrently. 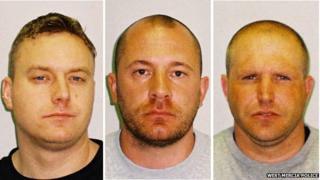 The four all pleaded guilty and were sentenced at Shrewsbury Crown Court on Monday.